Design that leaves you petrified. Bad pun, we know, we know. Going beyond fashion, Rick Owens has brought his minimalist aesthetic to furnishings – we first saw him experimenting in this medium in 2010, and now he’s furthering his commitment, utilizing materials like petrified wood, ox bone and plywood to craft a small, monochromatic collection being exhibited at the Carpenters Workshop Gallery in London (Sept 12-Nov 29, 2013). 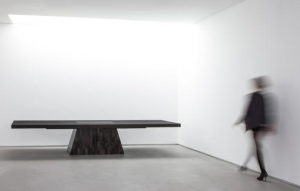 The aesthetic is exactly what you’d expect from Rick Owens, and the table pictured at right would look as at home in a modern dining setup as it would as an altar.